Always looking for opportunities to photograph brides and wedding paraphernalia and seek out potential clients, and not being averse to the occasional glass of champagne, I went along today to a reception to celebrate the relocation of the Pure Bridal Boutique to new premises in Lower Goat Lane, Norwich. I only had my camera phone with me, but captured a few images and some of these are included here. I’m really glad I found the time to call in, as I managed to talk to several couples planning to get married, had one or two good leads, and distributed some business cards and flyers. I also had some interesting conversations with others involved in the wedding business, includig a toastmaster and a wedding cake supplier.I’ve heard there is another new opening next week, so I will be sure to look by. if I can. 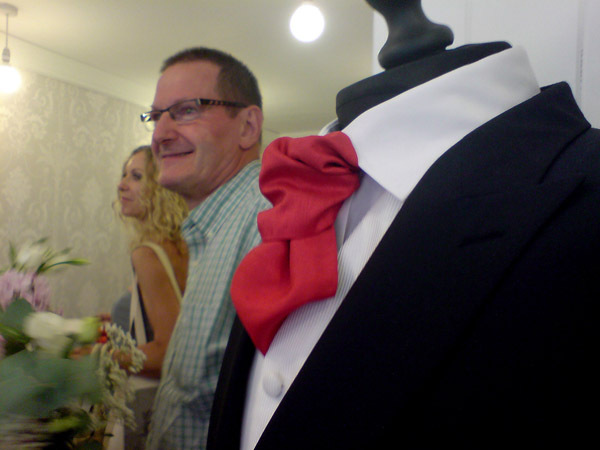 This entry was tagged bridal boutique, brides, champagne, documentary, Lower Goat Lane, Norwich, Pure, reception. Bookmark the permalink.